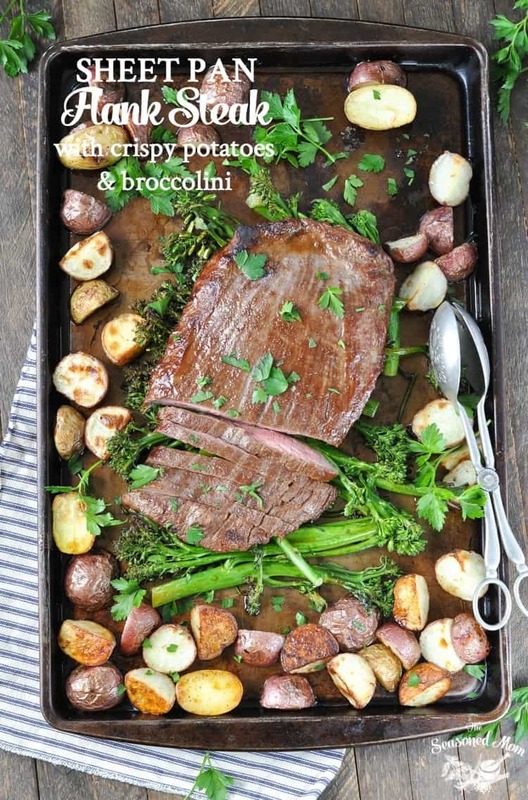 This easy sheet pan flank steak with crispy potatoes and broccolini makes a nutritious dinner all on one tray. It couldn't be easier and is super delicious! 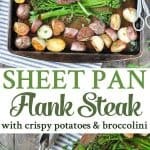 Cook an entire dinner on one tray with this easy recipe for Sheet Pan Flank Steak with Crispy Potatoes and Broccolini! It’s a simple, satisfying, and nutritious meal — with very few dishes to wash at the end! Personally, I’ve never been a huge steak lover. But I married a meat-and-potatoes lovin’ guy, and then gave birth to 3 meat-and-potatoes lovin’ boys. As a result, I’ve learned to prepare beef in a variety of ways…and this is by far one of my favorites! I can’t take full credit for the delicious flank steak, because it’s actually inspired by the flank steak marinade that my mom served regularly when I was growing up. It was the ONLY beef that I remember loving as a child, and it remains one of my favorites to this day. Something about the sweet, savory, tender, and juicy meat sliced into thin strips just makes my mouth water. 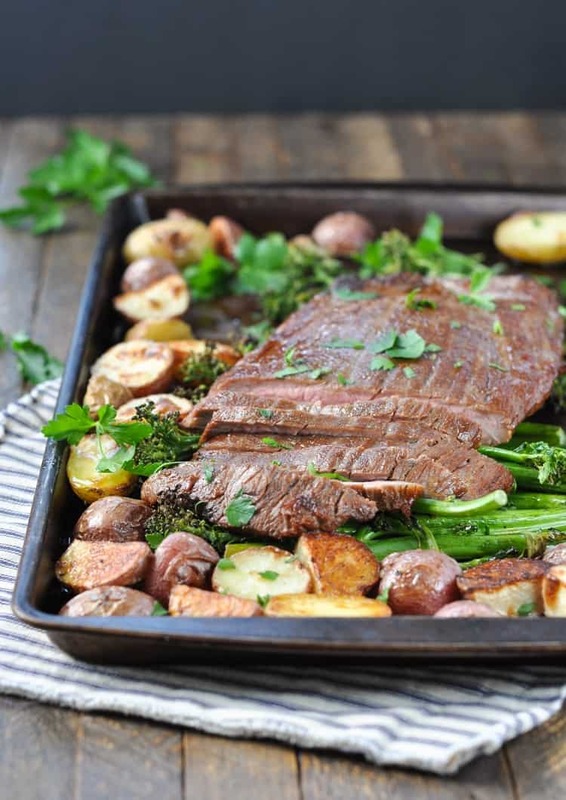 I love to serve the flank steak sliced over a big green salad with plenty of other chopped veggies when I’m looking for a light option; however, the ease of preparing this entire dinner on ONE TRAY — complete with crispy oven-roasted potatoes and browned, charred baby broccoli — makes it a winner in my book. 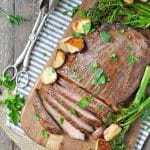 My Sheet Pan Flank Steak with Crispy Potatoes and Broccolini is a meal that makes my growing boys smile, while also transporting me back to happy childhood memories of my own! Cooking for Just Two? You can either find a slightly smaller flank steak and cut the rest of the ingredients in half, or prepare the full recipe but freeze the leftover steak. I like to use leftover steak in tacos or French Dip sandwiches later in the week! Want to Prep Ahead? You can marinate the meat up to 24 hours in advance, so that there’s very minimal last-minute work involved! In a small bowl, whisk together soy sauce, olive oil, vinegar, honey, ginger, and garlic powder. Place flank steak in a large Ziplock freezer bag. Pour the marinade into the bag and toss to coat. Seal the bag and refrigerate for 30 minutes (or up to 24 hours). Line a large, rimmed baking sheet with aluminum foil and set aside. Place top oven rack 6 inches from heat. Preheat oven to 450°F (230C). Spread potatoes on the prepared baking sheet. Drizzle potatoes with butter, remaining 1 tablespoon olive oil, ¼ teaspoon salt, and a pinch of black pepper. Toss to coat. Bake potatoes for about 15 minutes. Stir potatoes and move them to the outer edges of the pan. Place broccolini in the middle of the pan. Place steak on top of the broccolini and discard the remaining marinade in the bag. Change oven setting to BROIL. Return pan to the oven for 6 minutes. Turn steak, stir vegetables, and broil 6 more minutes (or until it reaches desired doneness). Remove from oven, allow steak to rest 5 minutes. 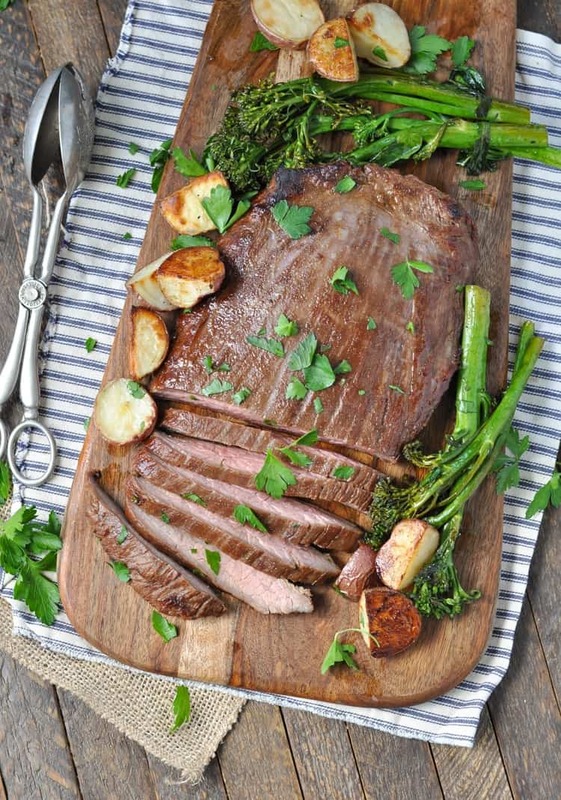 Slice steak against the grain, and serve with broccolini and potatoes. Want to Prep Ahead? You can marinate the meat up to 24 hours in advance, so that there's very minimal last-minute work involved! Once again, it looks like a winner! I’ve never tried cooking flank steak this way, but I’m all about only dirtying one pan. Can’t wait to try it! Just bought flank steaks so excited to try the one-sheet method vs the usual grilling. A huge time saver. Just pinned! Awesome! I hope that you love it! The clean up is a cinch, too! This is AWESOME!! Thank You. Would have loved this if I wasn’t afraid of cooking it to medium, ,was just to rare, broiling for 10 minutes on each side of my thin flank steak would have been better for us, small cut potatoes would have been better cooked longer also. Did love the flavor of the marinade.